Welcome back to some old Friends. 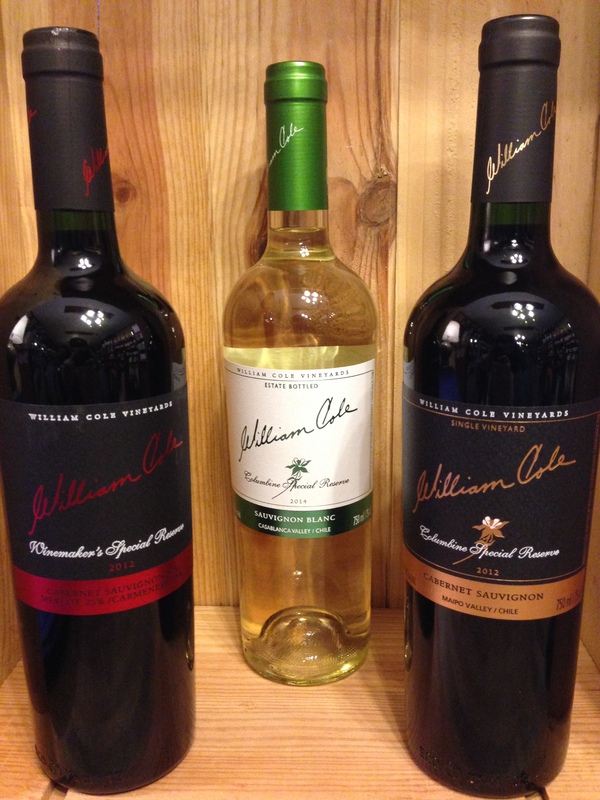 We’re delighted to welcome back some old friends the lovely wines from William Cole Vineyards. William Cole Vineyards lies deep within Chile’s prestigious Casablanca Valley—often called “Chile’s Burgundy.” This cool climate vineyard near the coast, which is comprised of over 129 contiguous hectares, provides a long, warm growing season with cool nights to develop excellent acidity. Owned by Bill Cole and family, the winery specializes in cool climate varieties, and the wines are crisp, clean and complex. We have welcomed back the 3 wines above along with a great Chardonnay and Pinot Noir, but today we’ll look at the Bordeaux varieties. The nose has inviting citrus and tropical fruits followed by notes of peach and white flowers. The palate is fresh and vibrant with crisp lime and citrus flavours over some nice white peach. Excellent cool climate white. This Cabernet Sauvignon has a ruby colour of great depth and intensity of black fruits predominate, such as blueberry and blackberry, with some notes of oak spice. The palate has a round silky feel that is bristling with black currant and damson, fine grippy tannins give and excellent long finish. Great paired with lamb. 50% Cabernet Sauvignon 25% Merlot 25% Carmenere. This wonderful blend employs Chile’s “Signature” grape Carmenre. The boquet gives hints of walnut, all spice and red pepper over concentrated cassis and redberry. The palate is juicy with nice oak notes and flavours of tobacco, strawberry and rich blackberry. The tannins are smooth and integrated perfectly, giving this wine a long distinguished finish.